To view the full list of items that we bought from Taobao, see our other post. This article assumes you have already created an account on Oops.sg and you are using the DIY Reship service (i.e. you buy the items on Taobao yourself). 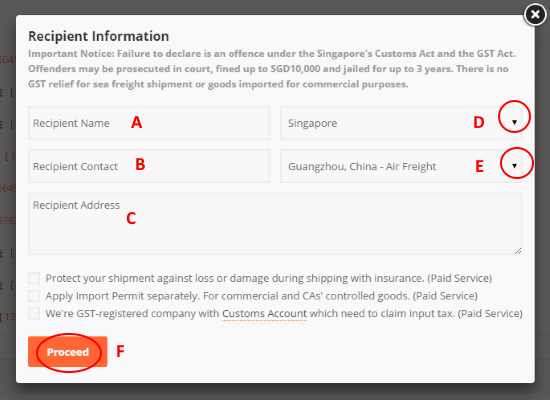 However, for the uninitiated, you may want to use Oops.sg’s Assisted service which is simpler as they will help you do the purchases on Taobao but you have to pay them the agent fees. A: Check the rating of the seller. Each is out of 5. The higher the better. C: See how many recent transactions there are. The more the merrier. D: After that, select any options for the item and then click the big orange button to add it to cart! Now before you enter your address, you have to go Oops.sg, login and go to Order > DIY Reship Service > Warehouse Addresses button at the bottom right. 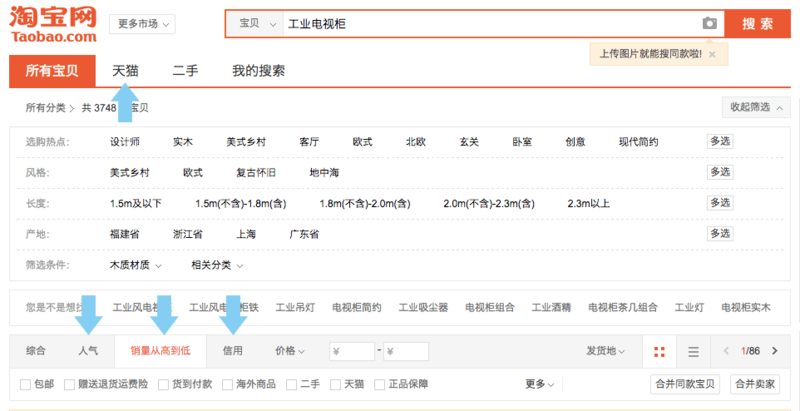 Click on 使用新地址 to add a new address. Go through all the dropdowns to type in the address as above, include the AXXXX code to reference your Oops account. Click the save button. 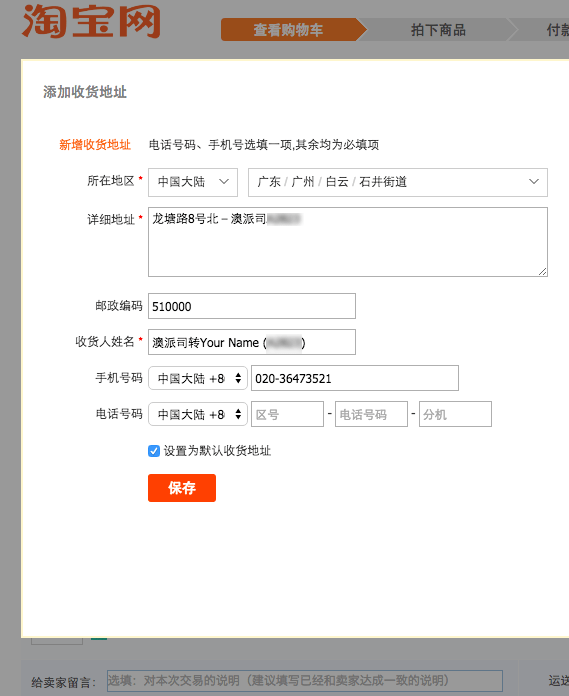 The first time you reach this page, you will be asked to set a 6-digit PIN for Alipay. This is a different password and will only be used for payments with Alipay. 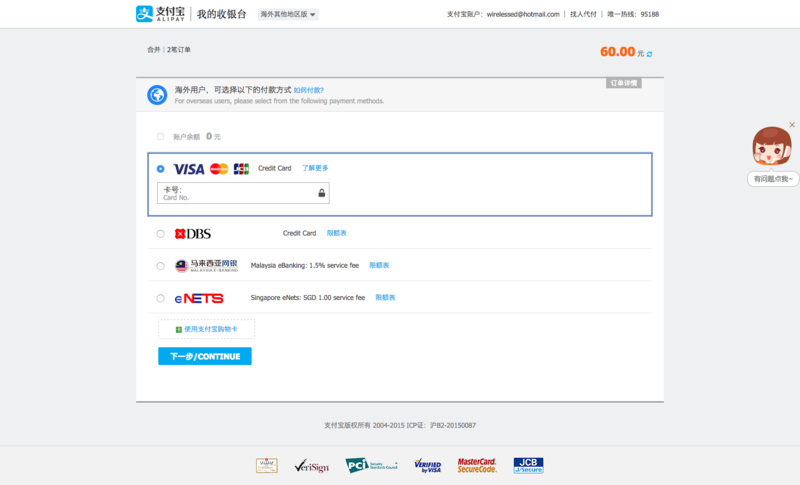 After that, you will be led to this page with the payment options. (Ensure that you are on a desktop computer, a mobile version of the website will not lead you to this screen.) So you now have a choice of using VISA or eNETS. VISA charges a 3% surcharge on top of your final bill, plus any currency conversion charges by your credit card. eNETS charges $1 service fee. Generally, VISA is cheaper for purchases below SGD $30. Above that, use eNETS. Enter your card information and you will be asked for an OTP. If you use eNETS, you will be redirected to your bank’s payment gateway. If you see this page, your payment is successful! Some items require you to talk to the seller to complete your purchase, especially if you are buying the furniture that can select the type of wood, the wood colour, custom sizing and measurements etc. 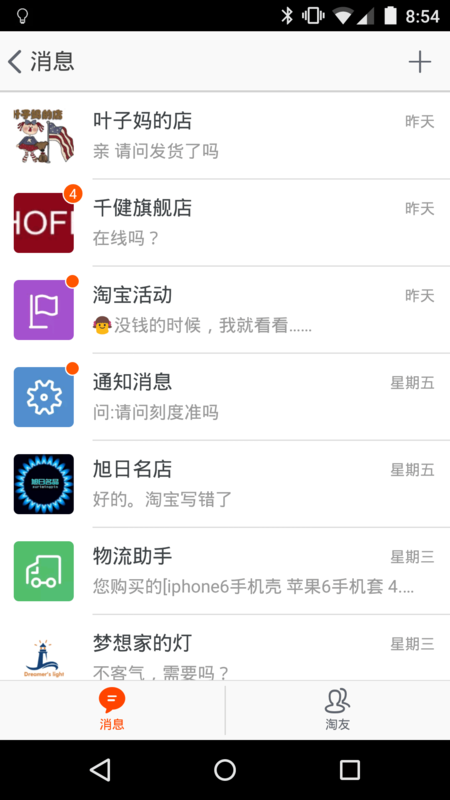 This is the step that turns many people off especially if you are not able to converse/type in Chinese! If so, please use the Assisted Purchase method instead of DIY! But if you already paid for your purchase, it might be too late. Ask someone who can converse in Chinese to help you. 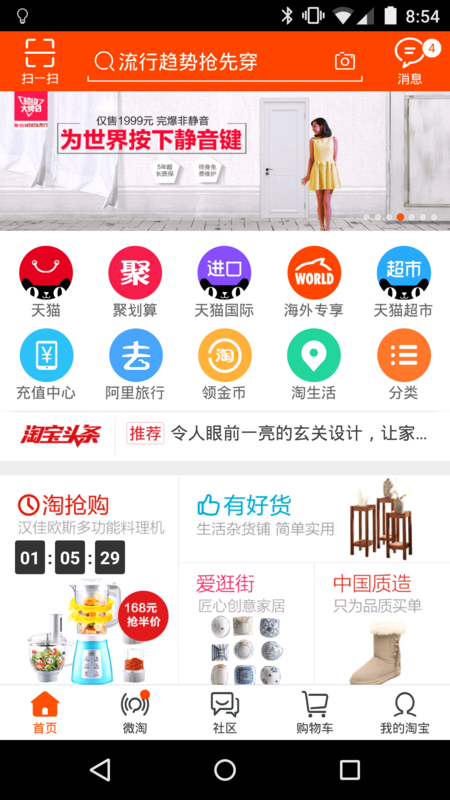 The easiest way to talk to the seller is using the Taobao mobile on your Android phone or iPhone. Alternatively, you can also download the Aliwangwang app for your PC or Mac. Both receive the same messages from the same taobao server. On the home screen, tap on the icon on the top right hand corner. These are all your messages. You can see if any seller contacts you on this screen. In the app, you can also look for the items you have bought and find the seller to chat with them. 待付款: Awaiting payment. You should have no items in this tab if you successfully paid all your items. However, if you have not paid, you can cancel items in this tab. 待发货: Awaiting shipment. If the sender has not shipped the item, it will be in this tab. 待收货: Awaiting receipt. If the sender has shipped the item, it will be in this tab. However, this does not mean the shipment has successfully shipped. You have to check each item individually (more on that later). 待评价: Awaiting review. If you have received the item, it is awaiting review. However, if you did not acknowledge receipt after X number of days, the items will also automatically move to the last tab. After a few days, your items should be in 待收货. 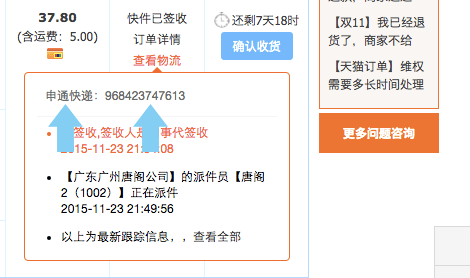 To track your shipment, hover on the link 查看物流. Take note of the following two things above: XX快递 (Shipping company) and the tracking number after that. You will need this for Oops.sg. 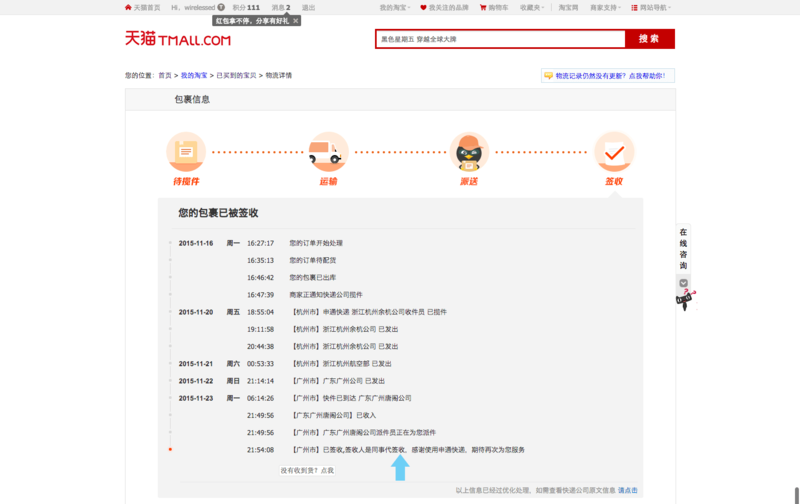 Click on the red link 查看物流 and you will see the tracking details as seen below. When you see 签收, it means Oops.sg has received it at their warehouse! Next, you have to go back to Oops.sg and go to Order > DIY Reship Service > Incoming tab. 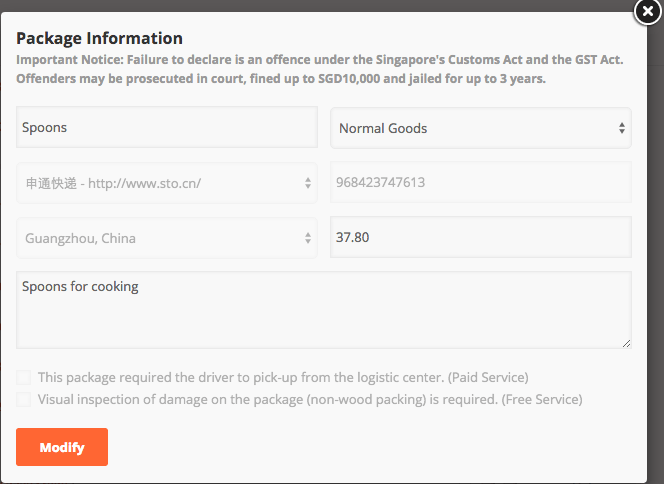 Once the items are 签收 by Oops.sg, they should appear in the list above. This is when you should match the shipping company and the tracking number of the individual item. Once you found a match, click on the edit button to declare the package. Type in the relevant information for the package, e.g. price, description for customs purposes. Once all your packages are done, you can ship your items! For the last step, it will be easier to read the steps on Oops.sg’s tutorial. However, ensure that ALL your items have arrived before you click the “Prepare Shipment” button. Because once it is done, you cannot undo and add any additional items to the shipment and you may have to pay additional charges for separate shipments! One last note, be sure to choose Sea Freight in box E if you are shipping large items like furniture. Check out the full list of things we bought!